Craft it Forward: Do You Want to Play? What a fun day! I discovered a great new blog and at the same time squeaked in on her pay-it-forward 2013 offer. The first five people to comment on this post will receive something I’ve handmade. You’ll receive your handmade gift via snail mail sometime during 2013. Who doesn’t like ‘real’ mail? I can’t say what exactly it will be but it will follow a gardening theme. It might be a set of cards, a decorative piece, who knows. Surprises are part of the fun. In return, please pay it forward by offering the same deal to five other people, via your blog, Facebook or Google +. If you want to play, please comment below. Remember, the first five to comment receive a Gardening Nirvana craft-it-forward creation. Here’s a peak at a few of the crafts I put together back in 2009’s pay-it-forward. This entry was posted in Gardening, Scrapbooking and tagged Cats, community, Craft, crafting, DIY, do-it-yourself, Facebook, google +, Pay it forward, Scrapbooking, Snail mail, tag board albums. Bookmark the permalink. Once again, totally awesome Alys! I see some grand idea’s brewing. Go and create fantastic art. I’m so glad you’re in! what a great idea I love it Alys! I love the kitties too is it a wall decoration or a cute note book? Thanks, Sheila. It’s a tag board photo album. I actually found the form at Scrapbook Island a few years ago. Then I added paper, ink and embellishments for someone else who also loves cats. It was fun. OMG I’m laughing so hard I have tears in my eyes….what the heck Alys, I typed that so fast I didn’t even stop to correct all the spelling. LOL 😀 woop woop!! count me in, Whew, just made it. Anywho, this is soooo fun. I can’t wait! Those kitty cats were sure cute. Did you sew the handbag? I can’t even imagine how much work that was. I’m going to pop over to your link and see what’s happening over there. That’s such a pretty card you’ve made, the papers are totally gorgeous. I’ve never seen that collection here. Jim wore a purple shirt today as did the other two guys that work with him…I of course unplanned but I guess they got a lot of ribbing for being so matching. Oh how fun that they all arrived in purple shirts. I love that. The handbag is actually a tag board book. I covered all the pages and used some hardware on the cover. I was delighted to find the black and white purse paper, then colored several of it in with markers. My friend Laura collects purses, so this was perfect for her. I made the card using Japanese Washi paper. They sold it at the Island, but it wasn’t successful, so I found small bags of it on clearance. It was hard to cut and glue, but I liked the texture and the finished effect. It’s pretty cool paper. Laura must have been totally in love when she saw it. I’ve never seen that idea b4, very cute! I have seen the Washi paper around but I’ve never crafted with it. Gorgeous results though. Congratulations on filling up your player list so fast too, people are being shy over at Boomtown, one so far! Thanks for watching out for me Alys. I was a little nervous for a bit that no one would play but It’s ok with only a few. Darn, I don’t want anyone to feel intimidated. I need to post a flub craft day….I’m pretty sure there’s a few…LOL. I feel the love 😀 and love you too! You aren’t at all intimidating. I hope that didn’t come across wrong. I just meant that your crafts are so inspired and so detailed, that we all feel like bowing at your feet. Thank you! Darn internet connections. They can be infuriating, can’t they? Not at all! I thought it was funny, because we’ve all been there. Technology is fantastic…till is stops working. I feel like I could take a 40 hour course on technology and still only scratch the surface. I’m so glad you are looking forward to it, too. Boo! Missed it! Oh well, look forward to seeing what you have in store for the lucky winners!! Aren’t you glad the rules are so flexible? 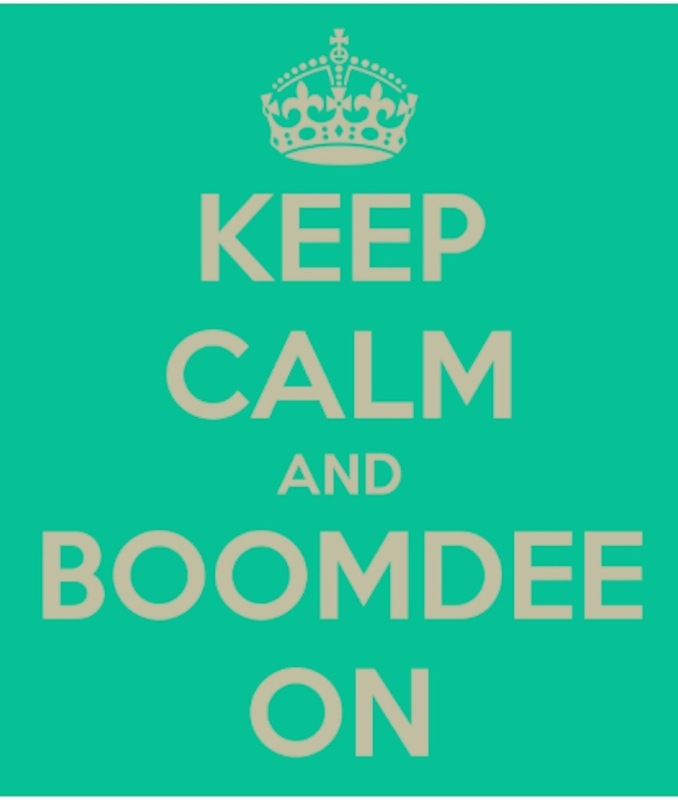 I’m still laughing at Boomdee’s reply! Classic! Today I spent an hour with my Mum who gave me a crash course in embroidery and then visited a craft shop to talk to a lady about decoupage. I’ve even decorated an egg box this afternoon! I see a new hobby in your future. Hi there Alys! I’m so happy you’ve already set up your Pay It Forward and had such a warm response. That’s the name of the game 🙂 Thanks for the ‘shout out’ as well. This should be a lot of fun! (I’m also going to use your numbered list idea and add my top five (six 🙂 ) at the bottom of my post). Thanks, Catja! I’m so glad to have connected with you. Fun times ahead. Me too. Are you feeling better? Not really. Boo! This is day five. I’ve got to turn a corner soon, right? oh boo. Day 5, should be on the mend. And you are in good weather too! Doesn’t that automatically mean that you will never get the flu?? Lol. (Well, if it makes you feel any better, and I’m sure it probably doesn’t), it has been snowing here for 36 hours. Businesses closed, wildlife unable to walk around, small dogs show up as just tips of ears and the occasional nose. Sending you healing vibes! So is kitty. Sort of. Well, he’s mostly sleeping, but he’s dreaming you healing vibes. LOL. Sadly, the flu buzzes around here too and virtually every client or friend has been touched by it this year. I even got a flu shot, though they aren’t 100% effective this go around. Wow…36 hours of snow. I hope you get some relief soon. Oh I am so upset I missed your post and a chance to win – that will teach me to check my wordpress reader more often! The fold out card is just beautiful. I’ll make sure I check in more often now as I want to see what you’re going to make for the lucky five. And now you’re in, too! Hurray for that. Thanks for the compliment on the card. I learned how to make that style of card many years ago, and enjoy, now, putting a different touch on each one I make. Thank you so much for sharing. I’m glad you liked the cards. I can’t wait to see who signs up and what you make. Have fun!